For many years, even centuries, there was a huge divide between Shakespeare’s plays as they were performed and how they appeared in print. Scholars wrestled with the numerous different editions of the plays issued in the early modern period, trying to establish what Shakespeare actually intended to write, and quibbling over variant words and spellings. Meanwhile acting companies carried on performing the plays, heavily cut or adapted as suited the fashion of the day. Nobody much cared about how the plays had originally been performed. But gradually the two different ways of looking at Shakespeare came closer. Academics, realising that actors could often shed light on the plays, began to take the study of performance history and original performance techniques seriously. In the theatre, the rise of directors with an academic rather than theatrical background ensured that close examination of the texts became more important. Studying Shakespeare from page to stage has now become the norm. The Futurelearn MOOC (Massive Open Online Course) Shakespeare: Print and Performance, that first ran last year is now being re-run beginning on 23 October 2017. It promises to be a really interesting introduction to the subject that will take up 2 hours a week for 4 weeks. It’s been developed by King’s College London in partnership with Shakespeare’s Globe and the British Library, three organisations that traditionally would represent different approaches to Shakespeare. While the teaching comes from King’s, those on the course will be told about both current and early modern stage practices. 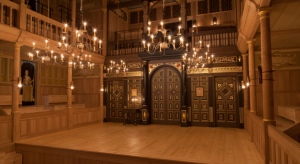 “We’ll meet practitioners at the Globe and we’ll step into the world of the early modern actor to examine the processes and conditions that were at the heart of Shakespearean playhouse.” The British Library will supply priceless manuscripts and early printed texts, and the course will look at how the early modern book trade shaped the journey of Shakespeare’s text. “Shakespeare likely had nothing to do with the printing and distribution of his own plays, and at first many of these printed editions did not even bear his name. 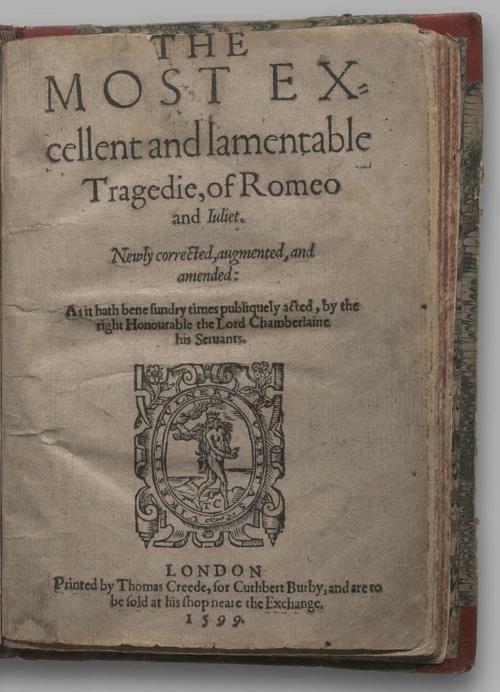 For instance, Romeo and Juliet was printed in 1597 and then again in 1599. The “first quarto”, sometimes called the “bad quarto” is often thought to be a memorial reconstruction rather than based on Shakespeare’s own “foul papers”, a fact that the printer of the second quarto draws attention to when he writes that his edition is “newly corrected, augmented, and amended” in 1599. 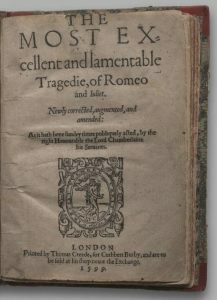 As Shakespeare’s name and reputation as a playwright grew, publishers and booksellers began to use his name on the title pages of his plays (and even on plays that he did not write). It was a full seven years after his death that two of the players from his company, John Heminges and Henry Condell, compiled his works for the First Folio in 1623. One of the highlights of the course will be the sessions filmed in Shakespeare’s Globe’s Sam Wanamaker Playhouse, their intimate theatre that reproduces as closely as possible the indoor theatres at which Shakespeare’s plays were performed, very different from the big open air playhouses like the Globe. The aim of the course is to get closer to Shakespeare and to enrich people’s engagement with the plays whether they encounter them in print or performance. As with all MOOCs, it is free and very easy to register. Those taking part will be able to join in online discussions where they will be able to share their experiences of Shakespeare on stage. I recently heard about another online resource that would enable those whose interest has been whetted to dig a bit deeper. 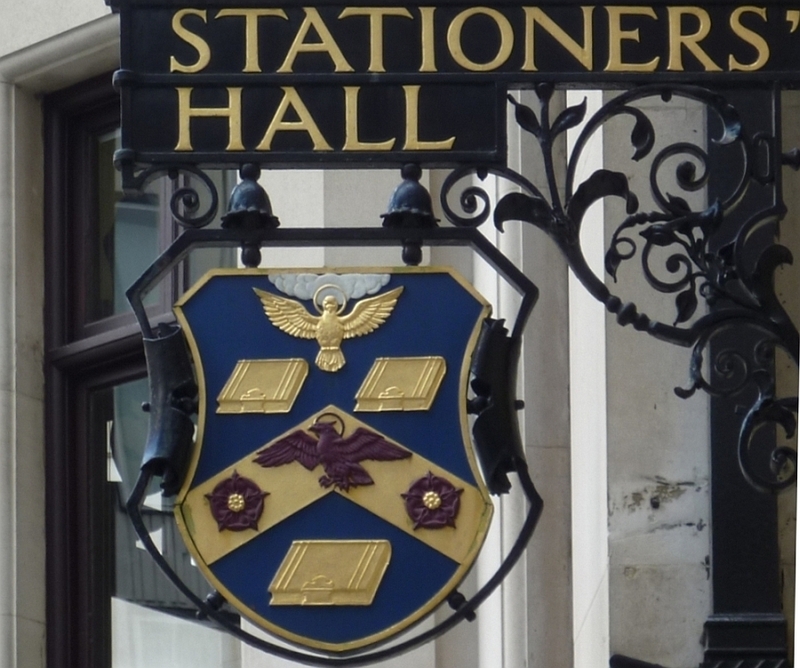 The Stationers’ Company is a London livery company that regulated to early book trade. From 1557-1923 all published material had to be registered by them. The Stationers’ Company Archive contains rare documents dating from 1554 that relate to printing, publishing, bookselling and bookbinding. The documents digitised include their registers of new books, including Shakespeare’s First Folio from 1623, and membership records dating from 1555 to the late 20th century documenting the history of the printing and publishing community. While I’m sure this is a wonderful resource for those who can access it, I’m very disappointed to find that unless you are affiliated to a university you can’t get past the homepage. It’s really irritating to be welcomed and encouraged to explore only to find that nearly all options lead to a blank sign-in sheet. I completely understand that digitisation has to be paid for, but in these days of Open Access surely it would be possible to provide some free content, or a pay per view option? As the growth in MOOCs shows, the interest in lifelong learning is widespread, and family historians would also be keen to search these biographical resources. But good luck to anyone able to enjoy the site! This entry was posted in Legacy, Shakespeare on Stage, Shakespeare's World and tagged British Library, Erica Moulton, FutureLearn, Kings College London, MOOC, Print and Performance, quarto, Romeo and Juliet, Sam Wanamaker Playhouse, Shakespeare's Globe, Stationers' Company. Bookmark the permalink.